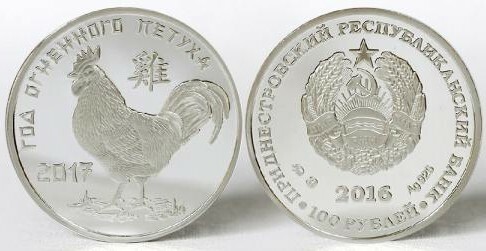 The Transnistria Republican Bank has put into circulation 100 roubles and 1 rouble coins "Year of the Rooster" from Chinese horoscope. Oriental Calendar coin series. Coins are issued in circulation from November 14th 2016. The obverse: in the center - the State Emblem of the Transnistrian Moldovan Republic; along the rim - the inscription: at the top - «ПРИДНЕСТРОВСКИЙ РЕСПУБЛИКАНСКИЙ БАНК» (Transnistrian Republican Bank), at the bottom - the Year of issue "2016"; at the bottom under the arms - the denomination «1 РУБЛЬ» (1 ruble.). The reverse: In the center - stylized rooster image; above - hieroglyph symbol 2017; left inscription - "2017" at the top of the inscription - "ГОД ОГНЕННОГО ПЕТУХА" (YEAR FIERY ROOSTER). The obverse: There is an image of the State Emblem Pridnestrovskaia Moldavskaia Respublika in the centre, circled by an inscription "ПРИДНЕСТРОВСКИЙ РЕСПУБЛИКАНСКИЙ БАНК" (Pridnestrovskiy Respublikanskiy Bank) in Cyrillic above the image along the edging and an inscription "100 РУБЛЕЙ" (100 rubles) in Cyrillic. An inscription «2016» left - the logo of the manufacturer, the state hallmark, right - designation of metal alloy. The reverse: In the center the stylized image of a rooster; above - hieroglyph symbol 2017; left inscription - "2017" at the top of the inscription - «ГОД ОГНЕННОГО ПЕТУХА» (YEAR FIERY ROOSTER).